Barack Obama’s Middle East gamble: The president is trying to engage the region on America’s terms. The president is trying to engage the troubled region on his own terms. Is that even possible? 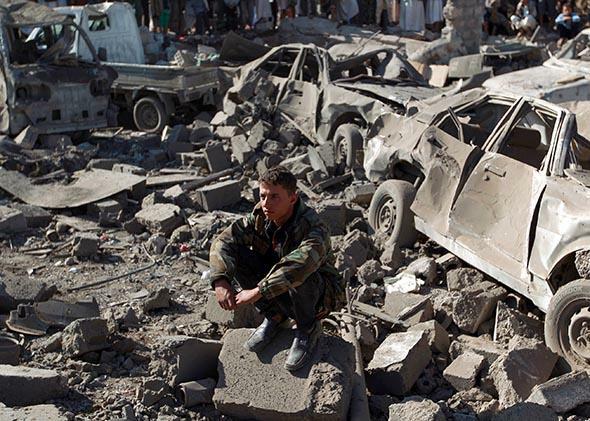 Realpolitik gets real: A Yemeni man in military fatigues surveys debris at the site of a Saudi airstrike against Huthi rebels near Sanaa Airport on March 26, 2015, which killed at least 13 people. The Obama administration is bombing Sunni radicals in Iraq (which, in the end, will help Shiite militias), while also helping Saudis bomb Shiite rebels in Yemen (which is intended to help Sunni regimes). Is this the product of a fractured, even contradictory foreign policy? No. It’s more a reflection of the fact that the Middle East is a messed-up place these days—and so, for that matter, is the world. In a certain way, Obama’s actions, taken together, can be seen as the product of a realpolitik policy. It’s a separate question whether realpolitik—the cold, calculating pursuit of one’s own national interests—can be effectively applied to the Middle East. In other words, it’s a separate but vital question whether Obama’s approach is shrewd or naive. Middle East politics these days are driven almost entirely by the conflict between Shiite and Sunni Muslims. Many of America’s allies in the region (Saudi Arabia, Egypt, Jordan, and the Gulf states) are ruled by Sunnis. Many of its foes (Iran, Syria, and such militias as Hezbollah) are Shiite or pro-Shiite. However, ISIS, which seems to be the No. 1 enemy in the region, is Sunni; the Iraqi government, with which we have a partnership, is Shiite. We share some interests with Shiites (for instance, the desire to crush ISIS), while we share other interests with Sunnis (for instance, the desire to oust Syrian President Bashar al-Assad and to contain Iran’s expansion). It’s this muddle that people are referring to when they talk about “the post-Cold War world.” It’s not just that the Soviet Union imploded; it’s that the bipolar international system imploded, too. In the old days, nations were treated as allies or adversaries according to whether they aligned with Washington or Moscow. This is no longer true. With the dissolution of the superpowers, a regional cold war has come to dominate Middle Eastern politics, based on the ancient rivalry between Sunnis and Shiites. At various times both sides have tried to lasso the United States into fighting this war for them. President Obama, for the most part, has tried to avoid getting pulled into a wider sectarian war—while, at the same time, pursuing U.S. interests. The nations in the region may see their politics in terms of the Sunni-Shiite confrontation, but that doesn’t mean Obama has to see it the same way. The main point is this: Obama seems to have made a calculation that beating ISIS is so important that it’s worth doing even if it means a slight expansion of Iranian influence. Some criticize this set of priorities. Retired Gen. David Petraeus recently said that containing Iran should take precedence over beating back ISIS. I disagree. ISIS is far more brutal than Iran; its expansion would be far more destabilizing than Iran’s; and finally, Iran is as prone to overextension as any other power. One question is whether Obama’s realpolitik approach is realistic. Is it possible to play a role in the Middle East without succumbing to the game as the locals see it? Can Obama side with Sunnis here, and Shiites there, as they align with his view of U.S. interests, without stirring distrust from all sides? In the summer of 2013, Obama at first made plans to bomb Syria, then backed away. The Egyptian and Saudi leaders erupted with fury, accusing Obama of betraying them. Certainly Obama handled the situation poorly; a president shouldn’t draw “red lines,” then ignore them when they’re crossed. But his main interest—what he saw as the U.S. national security interest—was to force Syria to give up its chemical weapons. Once that happened, at the prodding of Russia, the operation was over, as far as he was concerned. These leaders also see Obama’s moves as marking a retreat from the Middle East generally—to which, on grimmer days, Obama must mutter, As if. It would be great if the United States could peel away from the primitive squabbles of the Middle East and “pivot” to the dynamic growth and trade of the Asia Pacific. But, like Michael Corleone in The Godfather Part III, Obama keeps getting pulled back in by the crises. There’s too much at stake to walk away: oil, Israel, global terrorism, the crossroads linking west with east—if it all blew up, there’d be catastrophe. But does staying in the game preclude playing it our own way? Or does it require going all in, viewing everything through the Sunni-Shiite prism and either perpetually managing the conflict (probably impossible) or ultimately taking sides (extremely unwise)? Whichever way we go, there’s no way to avoid the mess.